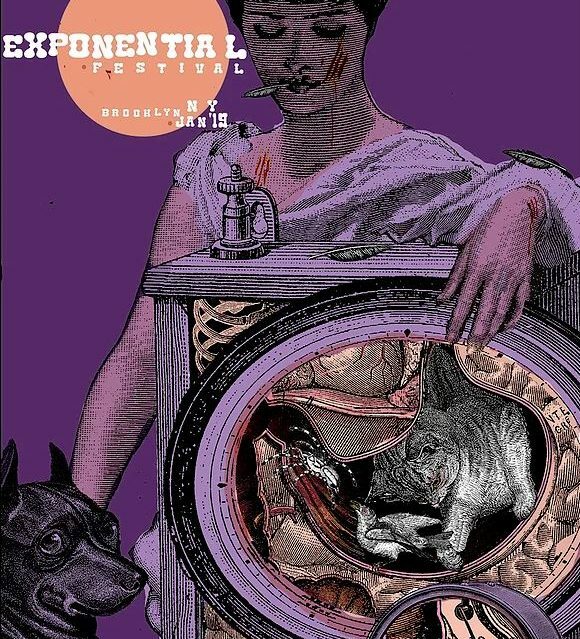 Of the four major January festivals in New York (Under the Radar, Prototype, American Realness, Exponential), Exponential is the baby of the bunch. But in it’s 4th year it has shown that if you want to have your finger on the pulse of new artists it’s a must. I saw four shows at the festival this year which gave me a look at a colorful and eclectic mix of new experimental work. Between them there were two cowboys, a sunset, a moonrise, multiple acts of audience participation, and at least four household appliances. There’s no unifying theme to the festival or the shows I saw but after seeing two shows about agonizing trauma in the other festivals the one underlying constant in Exponential is fun. There was a lightness, silliness, and joy to the works that I saw that was refreshing. While experimental work can sometimes be heavily self-serious, here some artists toyed with that tone to loosen us up. Others were making comedies with serious undertones. That’s right. The sequel to the sequel to the Ibsen by creative team Michael + Patrick (with help from Catherine Maria Rodríguez , Zoe Mann, and Ariel Sibert). Here, the three unruly offspring of Nora and Torvald Helmer are 9 going on 30. While they are “children” they scream, shout, and fight with one another, but they also spout off about queer performance, intersectionality, and the free gum they got from Ars Nova with their faces on it (this show had been in Ant Fest at Ars Nova last year). It’s a raucous, unholy communion of Ibsen-referencing, inside theater baseball, and identity politics that is darkly funny and madcap. I could have spent hours with the wackadoodle Helmer Trio. Ivar (Patrick Foley), Bob (Michael Breslin), and Emmy (Anna Crivelli) lip sync, rap, sing Gwen Stefani, and “Waving Through a Window.” All the while, Rodríguez hosts a make-up application video tutorial on the other side of the room while telling her own sibling stories. Themes of sibling rivalry, parental neglect, and inherited trauma abound. This “dance performance” (“it’s not a play”) is wholly self-aware. There is taunting fun at the expense of Lucas Hnath’s A Doll’s House, Part 2 which they claim to have not read (derisively hissing a “man with a ponytail won a Tony”–he didn’t win and maybe I transcribed that wrong between my laughs but I will never think of Hnath any other way). With excessive door slamming, tarantellas, references to a long absent mother, and their Norwegian childhood, it rests itself within the Doll’s House universe. Yet with ASMR (Auto-Sensory Median Response) segments (crunching pickles, tearing paper, chewing gum, quiet whispers into the microphone to create a tingling effect), a Sodastream and a Nutrabullet, and the application of colorful splashes of eyeshadow, it’s recalling a larger American space of consumerism, queer culture, and storytelling in the infomercial/YouTube era. A devolution into whether you can be Italianx (like Latinx) from spending time in Italy as a child made me die. While all this might sound incongruous, there is a strong dramaturgical base (shout out to dramaturg Sibert). I believed them to be Nora’s children struggling to find peace in the aftermath of her leaving as if plunked down in 2019. 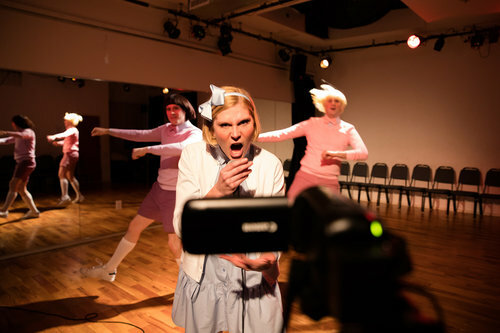 The show’s concept was tight with a strong production (even if the video camera got a mind of its own at one point) and each actor fully committing to their character (even if that meant occasional hissy fits or dance numbers). 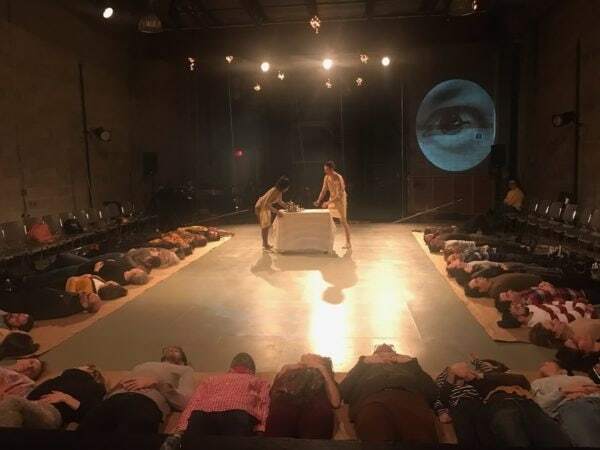 Staged in a dance studio with a mirrored wall, there is plenty of room to reflect on the self-consciousness of acting, theater, and why we frequently return to Nora’s story. And why so often it is a man telling her story (yes from the original onward). The artists have fun arguing about what makes a play, what acting is, and who is the best at it. The piece asks questions of who is in charge, who’s story is being told, and how we go about telling stories now. While there is excessive teasing and cruelty towards little sister Emmy just this side of torture, the nastiness and misogyny are addressed within the piece in part. Crivelli (looking like a wide-eyed Kirsten Dunst who can sing) gets a monologue about Emmy, her voice, her power, her contributions to the piece but most of all she reclaims the narrative for herself in the end. Her mother would be proud. 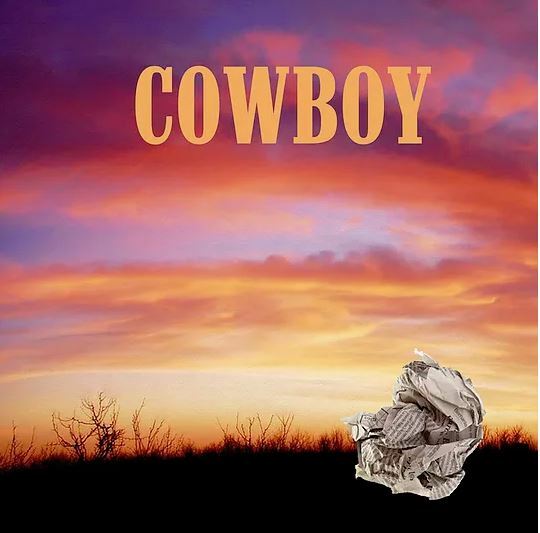 Playwright Gracie Gardner and director Charles Quittner’s Cowboy is a short play gem. With a different live actor each night playing the voice of the cowboy (Becca Blackwell the night I attended), he is physically performed on stage by a Stetson-wearing Roomba. He is a lonely cowboy who is directionless, searching for love (and dirt) in the wide open desert (theater floor). It’s a charming idea that is executed in an appropriately short format. The rest of the design aesthetic follows this home appliance format. A fan was a flower. A desk lamp a vulture. A painted power strip a rattlesnake. A bookcase cactus also helped when someone from the creative team had to hide behind it to go rescue the show’s mechanical leading man jammed in a corner. Blackwell’s cries of help when the Roomba got trapped were plaintive and droll. The Roomba’s rhythmic repetition was meditative and it’s unpredictably kept us oddly engaged. Would he head for the Cheeto crumbs or would he make a run for someone’s wine glass? At one point the Roomba looked like he was trying to flee the show all together. But there was a point to this casting–aren’t all romantic paths full of such unexpected twists and turns? Don’t you too get stuck sometimes? Don’t you want to run for it? The road to love is full of narrow escapes and glasses of wine you might spill. Roombas are not likely to be taking jobs away from humans anytime soon. But he helped make the point here. While it might seem that Woof Nova’s short Microcosmitor is ultra-reverent at the start, the tone shifts to something more playful. This is a movement-driven piece created by Annie Kunjappy and Daniel Allen Nelson. They both star alongside Temple Crocker. There’s a great deal of turning things upside down in the room and making the audience partial participants in the show. The acts of audience engagement were a mixed bag. We were asked to take off our shoes and check our coats at the start. I haaaaate taking off my shoes. Once out of the shoes, my sweaty feet were cold and only got colder as the evening progressed. I had to smell my own feet and everyone else’s feet for the duration of the show. This put me in a mood. When I asked if I could opt-out I got blank looks from the helpers. We also had to be “traced” on paper on the floor. So I’m carrying a bunch of bags, I’ve just surrendered my shoes, it’s freaking cold, and now I have to lay on a cold warehouse floor while someone draws me as a giant brown blob on paper. If I was not feeling self-conscious about my body upon walking in, I certainly was after seeing my blob on paper. I know it sounds like a lot of whining about a small things. These are activities that ask us to be vulnerable and out of control in ways not all audience members might want to be. They are the kind of lighthearted-in-intent artist actions that can be a lot harder to navigate if you have anxiety (and no warning they are coming). It certainly set me on edge about the show before it began. But the show eventually brought me back into its charms. Later we were told not to worry about our shoes so many times you couldn’t help but wonder what was happening to our shoes (no shoes were hurt in the making of this production) but it was this kind of theatrical teasing that made the show quite gentle in its execution (even if taking my shoes felt quite hostile). Our coats maybe also got into the theatrical action for a bit. Maybe the idea was that we all need to learn to let go a little. Noted. I sort of lost the narrative thread when they made us get on the floor (line-up with your blob). This time around I was happy to lay down and just peace out a bit. I was staring into the ceiling while light bulbs were pulsing above and the performer-creators were walking around with bubble wrap helmets and magnifying glass visors. But I found little moments of quirky play throughout—the irony of wrapping one performer up so she could not see while playing “I Can See Clearly Now” while the room is in a deep fog. In the end, this got me to smile and cold feet or not, there was pleasure to be had here. 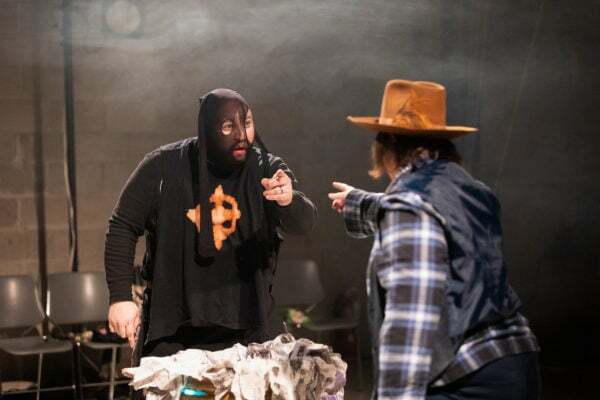 Title:Point’s bizarro short play Sleeping Car Porters hosted a battle of violence and taunts between Billy the Kid (Theresa Buchheister) and Zodiac (playwright Ryan William Downey). Sometimes their on-stage battles were intentionally cartoonish as if the best murderer was fighting for the title–wrestling, smashing dishes, duels. They were violent men but also in some sort of existential crisis–lost in this world without a purpose other than violence. They both looked weary from their mission. Death and destruction takes it toll. When Zodiac sat down next to me and asked me, “Who are we supposed to be?” I could only shrug. Where were we? What was happening? Could I get my shoes back now? Life is full of unanswerable questions, Mr. Zodiac.